I’ve been obsessed with making the perfect brownies for as long as I can remember. I am very critical of anyone else’s brownies too and I never feel more cheated than when I’ve eaten a disappointing one – the waste of calories for a start is enough to drive me crazy. I don’t normally advocate buying expensive ingredients for the sake of it, but I do think a really good quality dark chocolate makes a difference. I use Godiva 70% but that’s because it’s my absolute favourite and I’m a creature of habit. 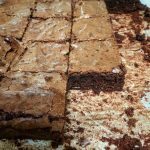 I will not claim that I have found brownie perfection, but this recipe is damn close and never fails as long as I don’t experiment with the oven times. You may need a couple of test batches before you get the right timing as each oven is different but what’s the worst that can happen? Underdone you have a delicious gooey mess that you can mop up with a spoon, overdone and you can just break it all up and stir it through some ice cream. The brownie should be just set on top like a cake, and slightly gooey in the middle. Make sure it’s completely cooled before you try and cut it (made the day before they are just as good). I usually trim the edges very slightly as they are slightly crustier and I love the prefect square – or at least that’s the excuse I tell myself as I’m stuffing the “edges” into my gob! Alternatively melt in short 30 second bursts in the microwave. Grate the orange zest into the chocolate and set aside. Whisk the sugar and eggs together in a food mixer, or by hand until light and fluffy. Pour the chocolate into the sugar and egg mixture and stir to combine. Sift the flour over the top of the chocolate mixture and fold in gently. Heat your oven to 180 fan, 200 conventional and line a 33cm by 24cm baking dish with baking parchment. Pour the mixture into the tin and level with the back of a spoon or a palate knife. These don’t deserve to taste as awesome as they do considering how quick and simple they are to make. Will definitely be making again.